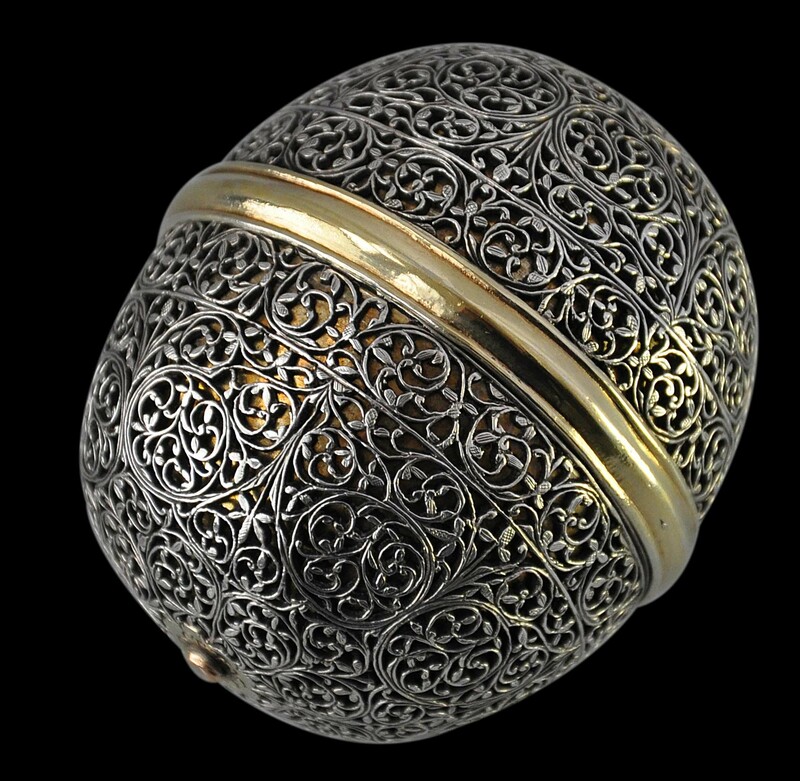 This extremely fine oblong spherical box was made to hold a bezoar stone. It is larger than most extant examples. 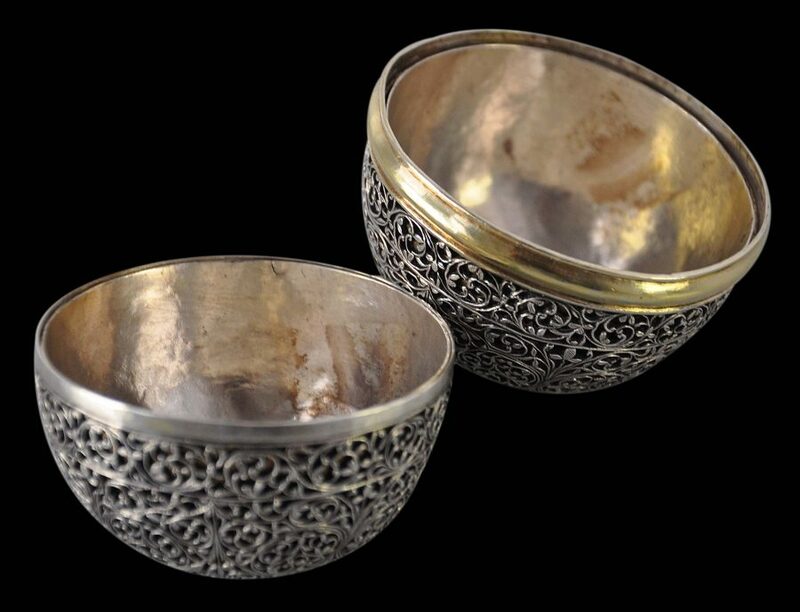 It comprises two halves, each of which consists of a fine, hand-cut, pierced, outer layer of scrolling foliate trellis work that has been engraved with cross-hatching and other patterns to provide further leafy and floral detail, and an inner layer of hammered silver sheet. Engraved, gilded flower motifs with raised centres possibly of rose gold decorate each end. The mid-section comprises a raised rib that has been gilded and which conceals where the two halves comes together. The outer layer of silver trellis work is not gilded. But the inner lay is, providing a pleasing contrast between the silver outer and gilded under layer. 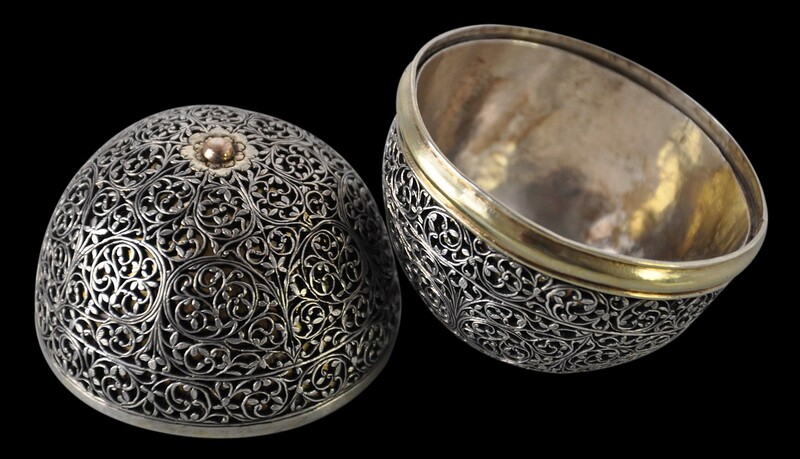 The work on the box, with its piecing, scrolling, engraving and gilding is very similar to a spectacular pair of covered bowls and tazzas that were attributed to late 17th century West India, and which were sold by Christie’s London, ‘Art of the Islamic and Indian Worlds’ April 8, 2008, lot 250 (see here). 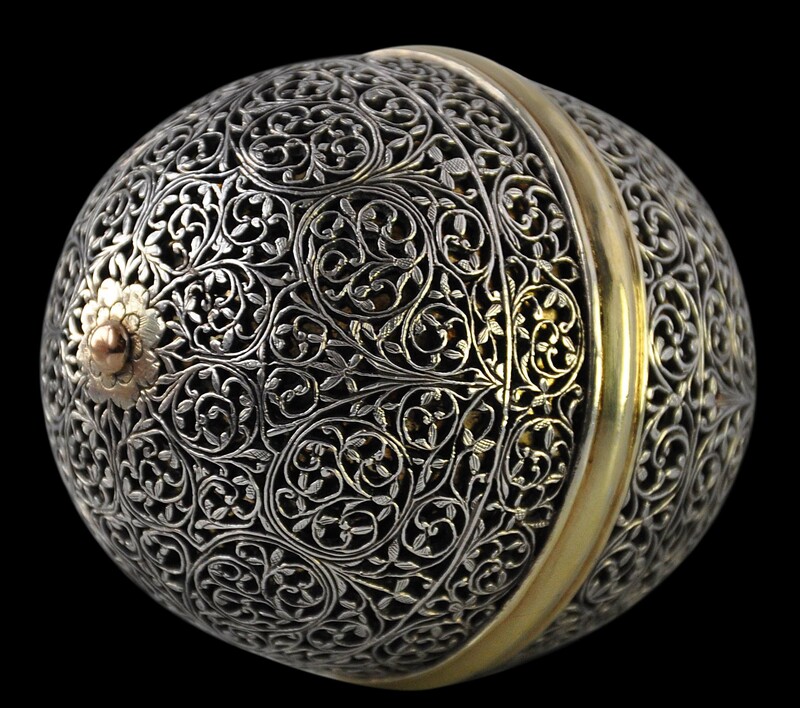 The tops of the tazzas had central, engraved flower motifs that are similar to those that appear on the ends of the bezoar stone box here. 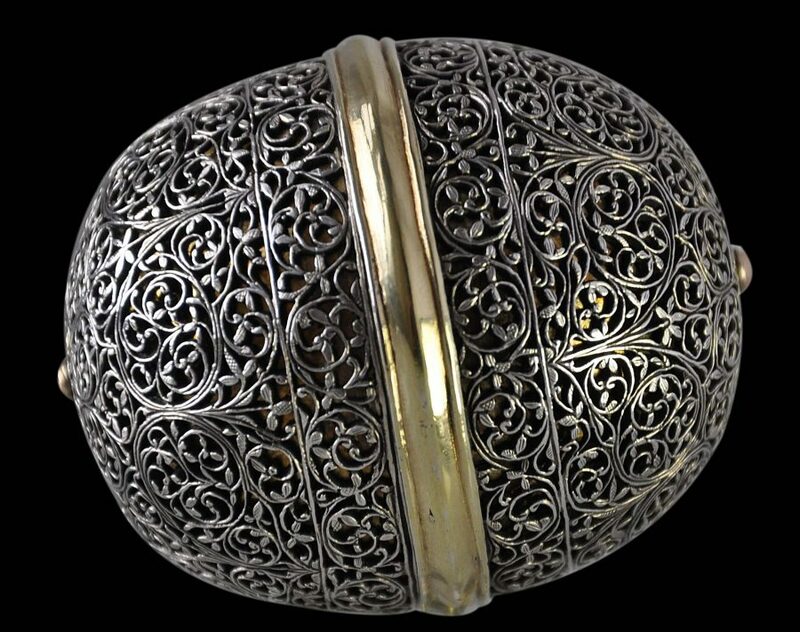 It is possible, indeed, likely that this box has come from the same workshop as the Christie’s bowl and tazza sets, and most probably is the product of Muslim Gujarati craftsmen. 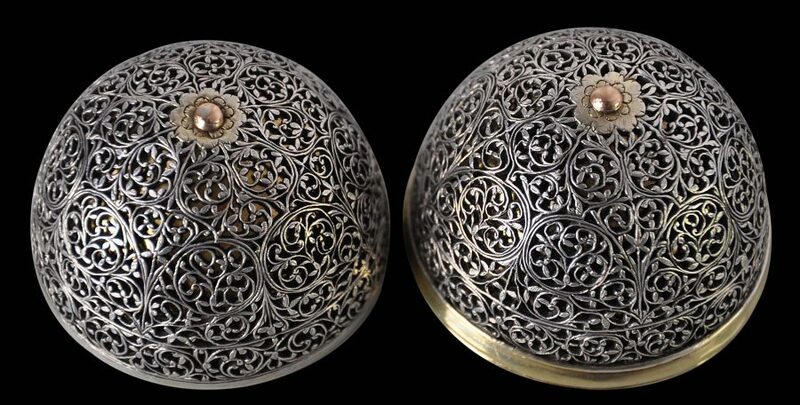 Several engraved and pierced silver bezoar stone boxes are known in public collections. Several are held in the collection of the Wellcome Museum of Medicine, London. 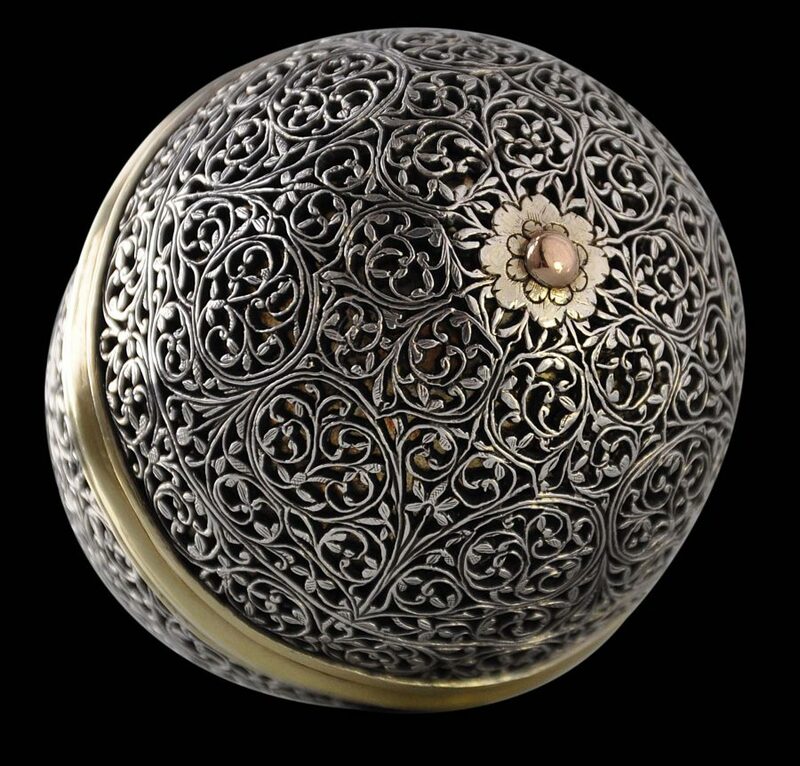 The Science Museum, London, has a gold bezoar stone box on a stand, its pierced and engraved scrolling decoration includes small animals (accession no. A642470). Two others, one silver, the other gold, both with contemporaneous stands, are in The Metropolitan Museum of Art, New York (accession nos. respectively 1980.228.1, 2a,b, .3 and 2004.244a-d). Click here to see an example in the British Museum. 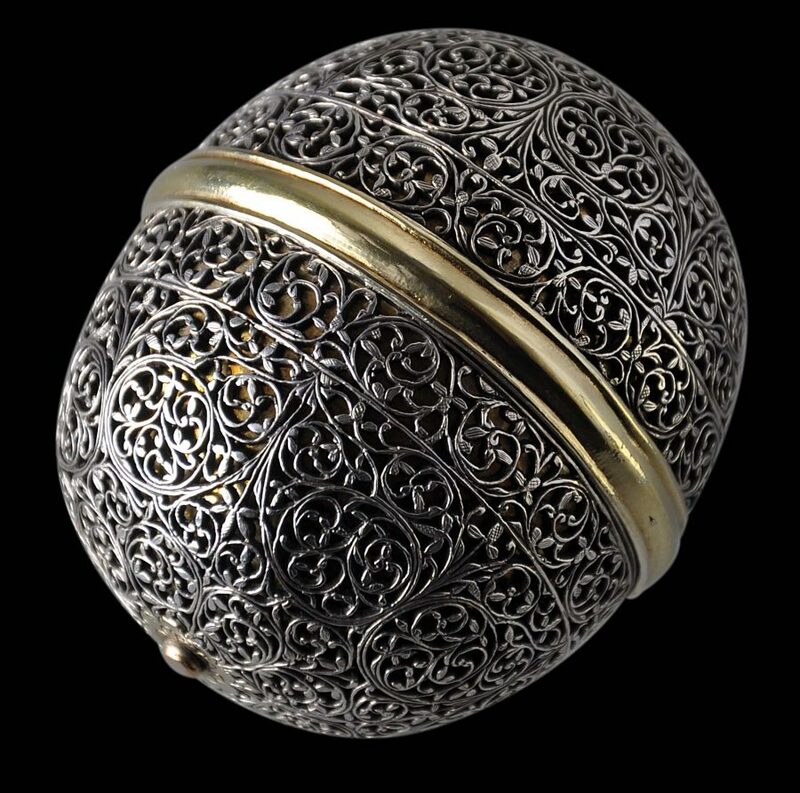 The well-known English collector, Horace Walpole (1717-1797) was the owner of a bezoar stone, which he acquired from the estate of his friend, the poet Thomas Gray (1716-1771). 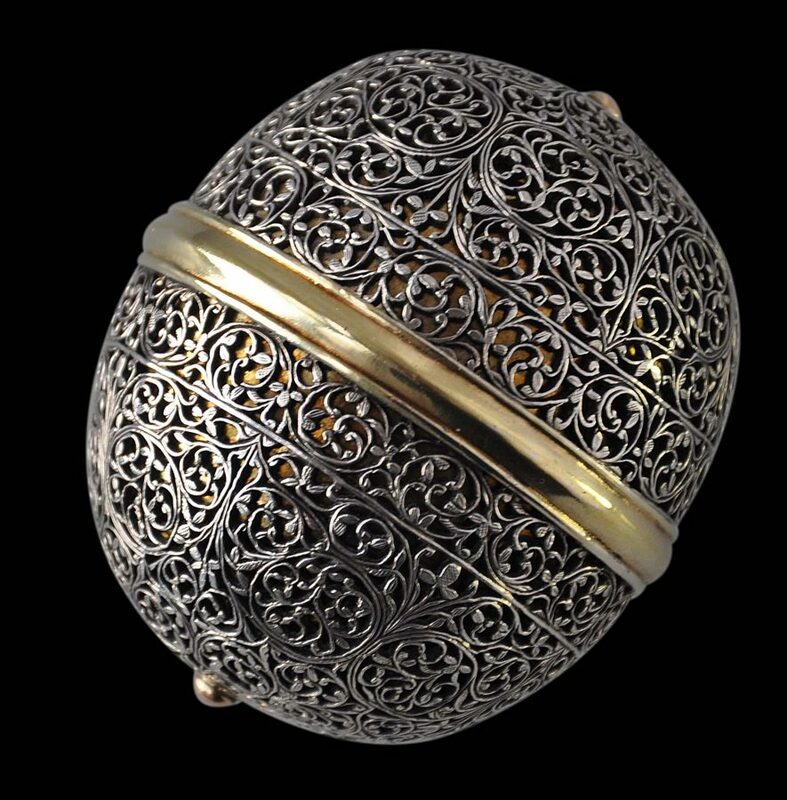 The 1784 publication Description of Strawberry Hill, Walpole’s House at Twickenham, included ‘a large Goa stone’ and ‘a silver box almost in the shape of an egg, engraved.’ Almost certainly, the latter was a bezoar stone box. 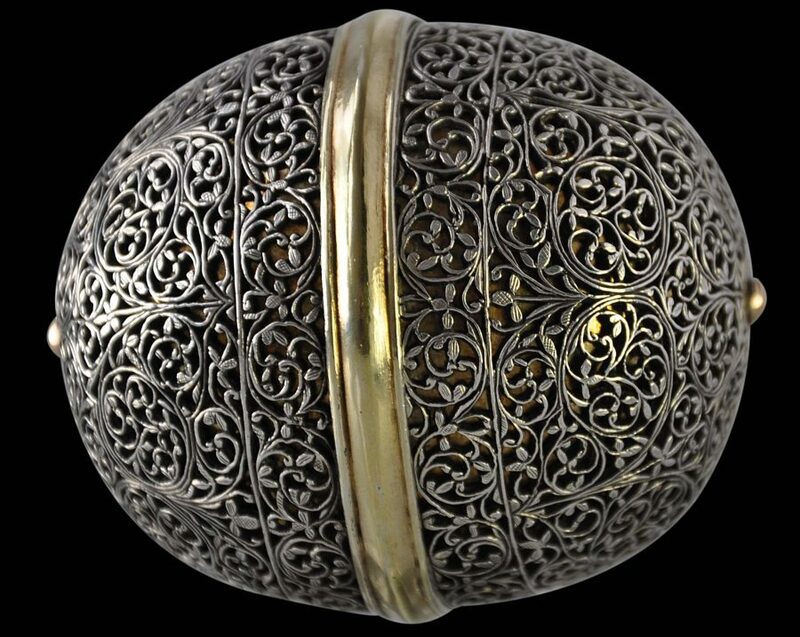 The king of Cochin sent Portugal’s Manuel I (reigned 1495-1521) a bezoar stone shortly before the Portuguese began trading there (Jordan, 2007, p. 91). The box here is in excellent condition, without dents, splits or restoration. 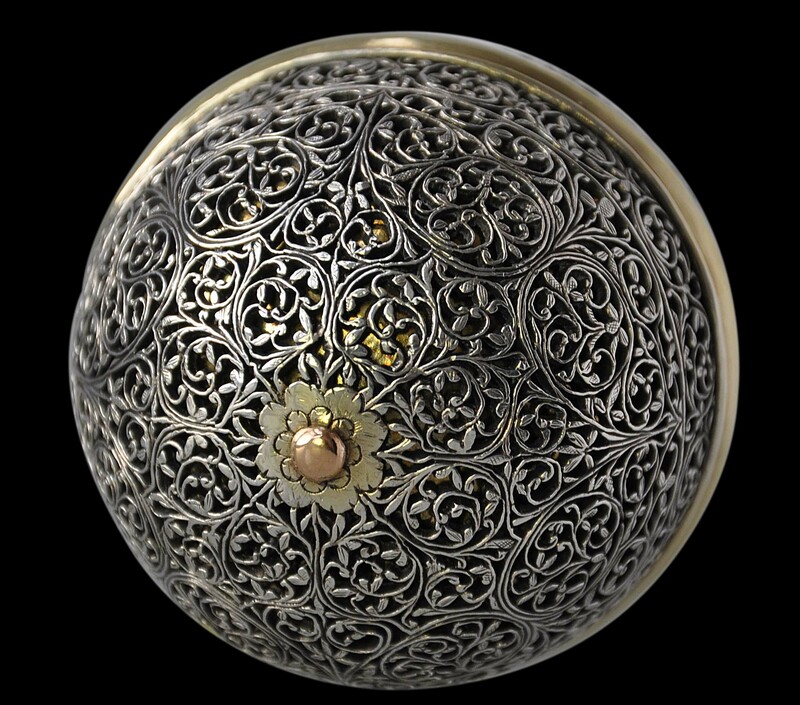 Its smooth curves and intricate work afford it a flawless, jewel-like presence. Jordan, A. et al, The Heritage of Rauluchantim, Museu de Sao Roque, 1996. Komaroff, L. et al, Gifts of the Sultan: The Arts of Giving at the Islamic Courts, LACMA/Yale University Press, 2011. Levenson. J. 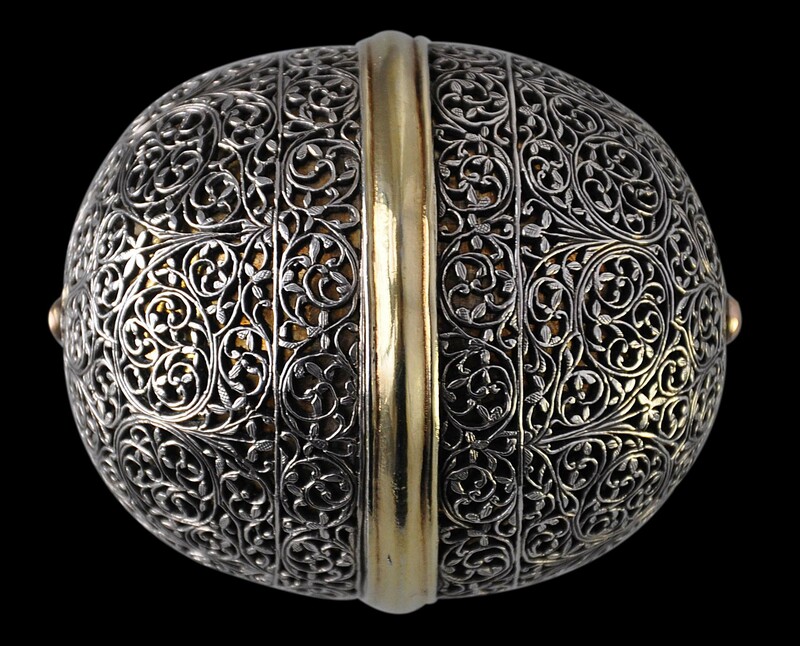 (ed), Encompassing the Globe: Portugal and the World in the 16th and 17th Centuries, Arthur M. Sackler Gallery, 2007.